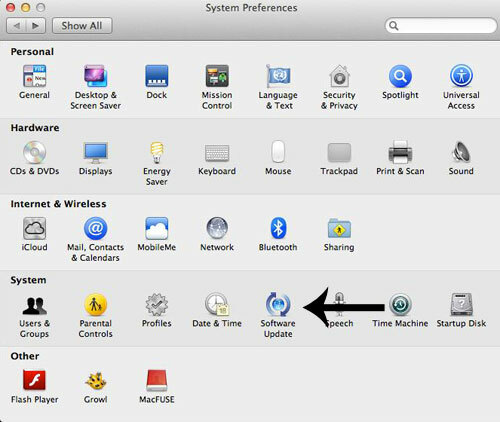 Keeping your Mac’s software up-to-date is one of the most important things you can do to keep your data safe and your computer running smoothly. 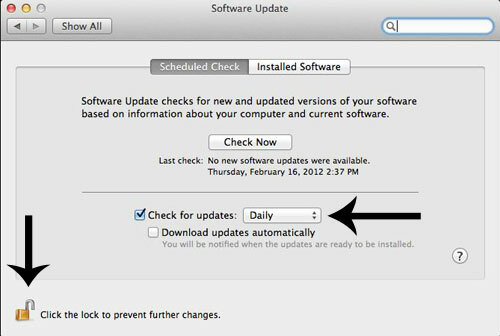 To make your Mac automatically check for software updates on a daily basis, perform the following steps. 2. Select the icon labeled "Software Update" under the "System" heading. 3. Click the lock at the bottom of the window and enter your computer's login information if prompted. Set the drop-down menu next to the words "Check for updates" to "Daily." Be absolutely sure to uncheck the box next to "Download updates automatically." 4. You may now close the window. 5. When Apple releases an update, Software Update will alert you with the following icon bouncing in your Dock. If ever you see “Mac OS X Update” listed, uncheck it and click the “Install x Items” button at the bottom of the window. Do, however, make a note of the version number in the column next to it. In the following diagram, you can see that the version number is 10.7.3. 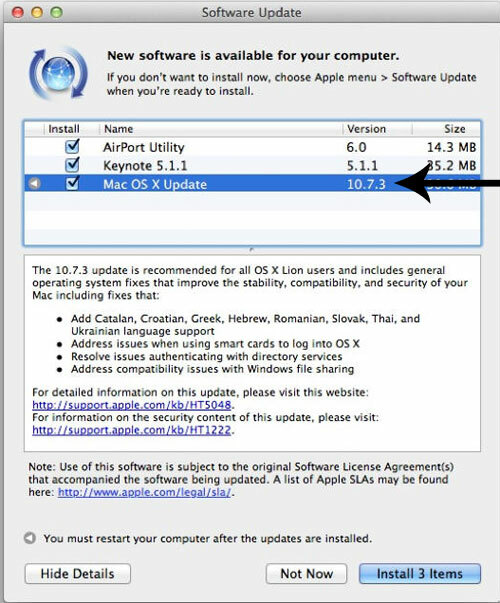 Refer to the next section, "Installing a Mac OS X Update," for steps on how to perform the Mac OS X Update.